Bob Baffert’s McKinzie took another significant step toward the Kentucky Derby by winning Saturday’s Grade III, $100,000 Sham Stakes in stylish fashion under Mike Smith, as he dominated by 3 ½ lengths while getting a flat mile in 1:36.58. With Baffert removing blinkers, McKinzie seemed more settled early than he had been in his first trip around two turns, a win, via disqualification in the Grade I Cash Call Los Alamitos Futurity at 1 1/16 miles on Dec. 9. The heavy 1-5 favorite in a field of six sophomores, McKinzie paid $2.40, $2.40 and $2.10. Owned by Karl Watson, Mike Pegram and Paul Weitman, McKinzie, a Kentucky-bred colt by Street Sense, is now perfect in three starts and with the winner’s check of $60,000, he now has earnings of $270,000. In a gallant effort, All Out Blitz, who tried two turns for the first time and was ridden by Tyler Baze, went to the front as expected and although he was no match for the winner when confronted a quarter mile out, stayed gamely for the place, finishing four lengths clear of My Boy Jack. Off at 14-1, All Out Blitz paid $7.20 and $3.80. Ridden by Kent Desormeaux and trying dirt for the first since his debut six starts back, My Boy Jack held off second choice Shivermetimbers by a neck and paid $2.80 to show. With the win, McKinzie picked up 10 Kentucky Derby qualifying points, with four, two and one point each going to the second, third and fourth place finishers. Fractions on the race were 23.69, 47.73, 1:12.17 and 1:24.22. MIKE SMITH, MCKINZIE, WINNER: “He was a bit too aggressive last time. Today, he seemed to relax early, then he jumped when I asked, so taking the blinkers off today, I thought we might as well try it and I think it was a great move. “He’s getting better as he matures. He ran a tremendous race in only his second time out last time at Los Al. The horses he ran with that day were top horses and we thought he’d move forward off of that race and he did today. BOB BAFFERT, McKINZIE, WINNER: “He just broke, got in a good position, didn’t get rank with the blinkers off. He was good, and when horses come to him, he really gets into the bridle. He got a lot out of this. Last time, he got a little tired at the end. It just goes to show you the Los Alamitos Futurity was a good race. They were good horses. “He came back to run like we hoped. I was happy. Everything went smooth; that’s what you want. I don’t have to work him that much before the next one. I don’t know (which race it will be). It could be the San Felipe (Grade II, $400,000, 1 1/16 miles March 10). We’ll try and get two (races) into him. I think he showed more maturity today. We sort of had had to rush into his earlier races. KARL WATSON, PART-OWNER, MCKINZIE, WINNER: “It’s really nice to see a horse you name after someone so important to you turn out to be such a nice horse, it’s great. “Bob picked the right one to name him after, that’s for sure. “I was pleased with today; I can’t say I was surprised because we all have a lot of anticipation, expectations for today. Bobby likes the horse and he’s a good horse, so we were hopeful and we’re very pleased. NOTES: McKinzie is named for Baffert’s late friend and long-time Los Alamitos executive Brad McKinzie. The colt is owned by Mike Pegram, Karl Watson and Paul Weitman. Baffert said Mourinho, scratched from the Sham, would run in the Smarty Jones Jan. 15 at Oaklawn Park. 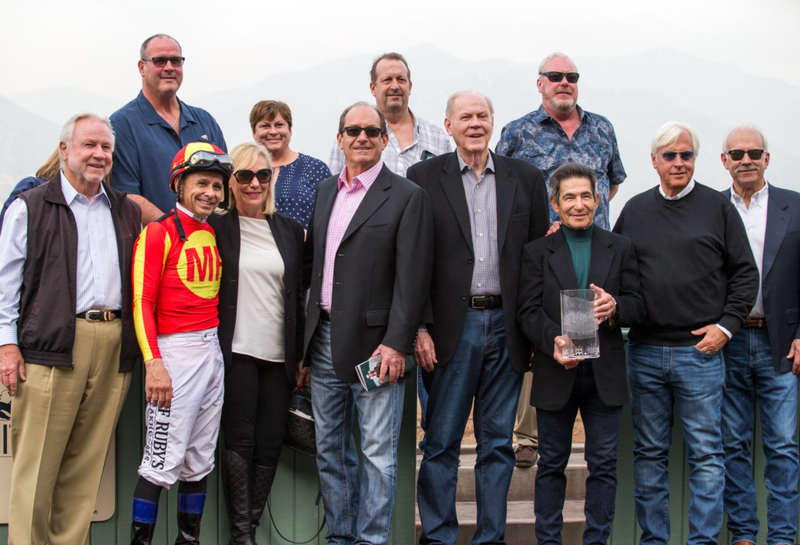 Hall of Fame jockey Laffit Pincay, Jr. presents the Sham trophy to Mike Smith, part-owners Karl Watson (pink shirt) and Paul Weitman (grey shirt) and trainer Bob Baffert.